Sound quality is an essential consideration at almost all events. At weddings and private parties, poor sound quality will mean that your guests will either be unable to hear the music or will find it too brash and intrusive. Either way, the fun and celebratory atmosphere will be ruined. At conferences and other corporate or civic events, it will cause attendees to have difficulty focusing on what is being said, meaning they’ll take less away from the occasion and probably be left with a negative impression of your business or organisation. 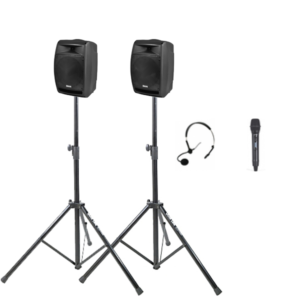 As a result, when it comes to speaker hire, Melbourne residents or businesses should always be careful to ensure they’re dealing with professional and reputable providers. Only by doing so can you be confident that the speakers you use for your event will be well suited to your venue and occasion, and that they won’t let you down half way through proceedings. Here at Conference Audio Visual, we’ve built a reputation for quality and consistency that we’re extremely proud of. When you choose us for your speaker hire in Melbourne, you can rest assured you’ll be working with true professionals who take their responsibilities towards their customers extremely seriously. The team at Conference Audio Visual has many years of experience in the industry. We use this experience, and the expertise it has allowed us to accumulate, to select only the highest quality speakers to provide for our customers. Every speaker we have in our range has been carefully selected by one of our team because of its superior quality and value. When customers come to us, they have the peace of mind that comes with knowing that their supplier shares their high standards and attention to detail. Your venue, occasion and requirements will all affect the kind of speaker that is most suitable for your situation. If you’re looking for something that will allow you to have slightly amplified audio when you play a video on your computer at your next team meeting, then smaller, ultra-portable and affordable speaker options are your best option. But if you’re looking for a speaker that will allow your band to raise the roof at an upcoming gig, Conference Audio Visual have suitable solutions for you too – and they are available at extremely competitive prices. We can even provide a simple megaphone if you’re just trying to find an effective and portable way to ensure you’re heard at an outdoor event. Whatever the nature of your event and however many people you have attending, you’ll find the perfect solution among our incredible range of speakers. We were founded in 2009 when two entrepreneurs with plenty of experience in the industry decided to act upon a gap in the market that they’d spotted long ago. Everybody knows that most audio/visual equipment hire firms are full of people who are passionate and knowledgeable about technology – but what most customers are really looking for is a team who puts them first and works closely with them to find the right equipment for their particular requirements without inundating them with jargon and superfluous technical information. At Conference Audio Visual, we strive to fill this gap in the market – and the praise and thanks we receive from our customers confirms that we’re getting it right. So if you’re looking for quality, affordable speaker hire, get in touch with a member of our friendly and professional team. We’ll be more than happy to help you find the perfect solution. 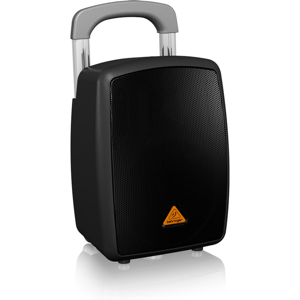 The 40W portable PA speaker system is suitable for small gatherings and localised audio projection. It’s perfect for weddings, parties, spruikers and impromptu speeches in locations where power may be difficult to obtain. This system is all about simple operation on the move. It features rechargeable battery operation, Bluetooth streaming and ability to plug in a corded microphone or wireless hand-held microphone. With rear wheels and an extendable handle, this PA system easily fits in the boot of any car. We stock Mackie, dB Technologies, Behringer, Chiayo, Parallel Audio and JBL and will supply the best speaker to suit your job. Paired with any of our mixers and microphones, we can assemble a complete solution. The 100W portable PA speaker system is suitable for medium-size gatherings. It’s perfect for weddings, parties, spruikers and impromptu speeches in locations where power is difficult to obtain. This system is suitable for outdoor use, weather permitting. 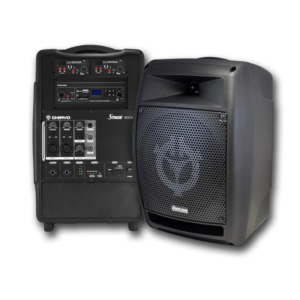 This top of the line portable PA speaker features a powerful 100W system. It’s equipped with two wireless microphones, which can be hired as optional accessories to the basic system. With rechargeable battery operation, Bluetooth streaming and the ability to play MP3 files from a USB or SD card, this little unit has everything you need. The unit comes in a lightweight case with wheels and easily fits in the boot of any car. Paired with any of our mixers and microphones, we can assemble a complete PA system solution to suit your specific requirements. 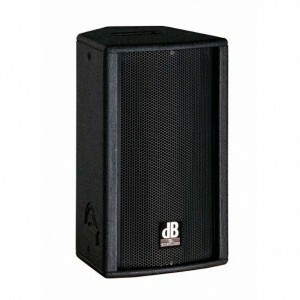 The dB Technologies 8″ ultra-compact range of speakers is suitable for small-size venues where a full-range speaker is required but only limited space is available. 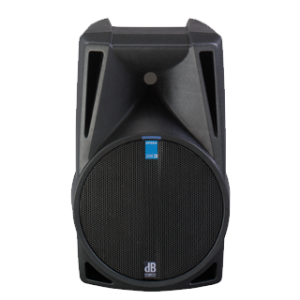 The 10″ powered speakers are suitable for small to medium size venues. These ultra-compact, full-range speakers are the perfect solution for corporate events where clarity of spoken word is your number-one priority. At 700W, the dB Technologies Opera Black Line 710 offers excellent performance for such a lightweight system (only 11.6kg). Our passive performance speaker range offers superb sound quality and can be used as a full-range system or a floor monitor for a band. Paired with subwoofers, this speaker is great for audio, whether it’s speech or music. 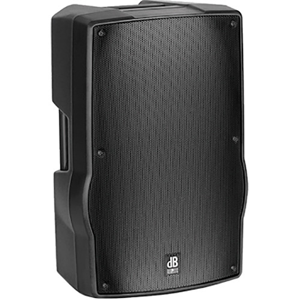 The dB Technologies Arena 10 Pro is a versatile speaker suited to situations requiring a compact PA setup. These speakers offer precise speech clarity, as well as full-range applications requiring lower level bass. Our passive outdoor speaker range offers superb sound quality and can be used as a standard full-range system. These speakers are treated to resist rain and extreme temperatures and can be linked together to cover large outdoor areas. This system is best suited to outdoor events such as festivals and community events – anywhere requiring wide-range audio coverage. 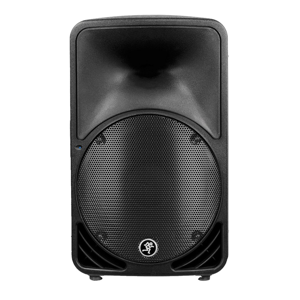 The 12” powered speakers are perfect for all audio requirements including bands, music, DJs and speech. The Mackie Thump 12BST has 1300W of power and features built in digital-signal processing (DSP) and Bluetooth connectivity. The system includes powerful onboard three-channel mixer, wireless linking of speakers and streaming. You can even control the system via an app for iOS and Android. 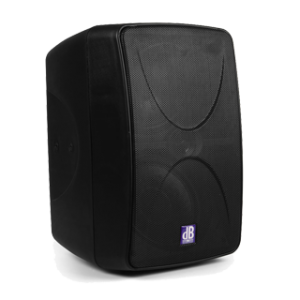 Pair the system with 18″ Mackie subwoofers for a massive sound or use them as stage monitors. This is an extremely versatile system and is available for hire today. Call us now on 1300 214 733 to discuss your requirements or click for a free quote. 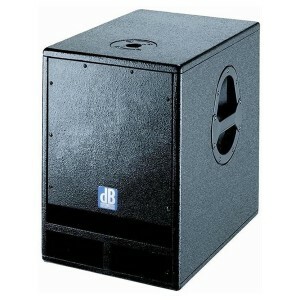 Powered subwoofers are essential for any band or DJ set setup. They provide depth, balance and improve your system’s overall efficiency. 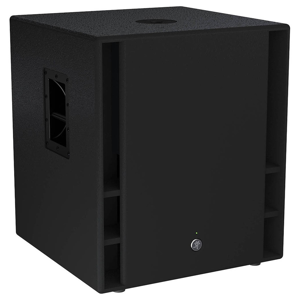 The 12″ powered subwoofer is a perfect choice for smaller scale PA setups that still need to deliver superior sound for bands or audio playback. Equipped with an 800W digital power amp, the dB Technologies SUB 12 D is an excellent system for users looking for small but power systems. This system is easy to transport and quick to set up. If you need something with a little more power, our 1200W 18” powered subwoofers complement all our PA systems to deliver superior sound for bands and audio playback. 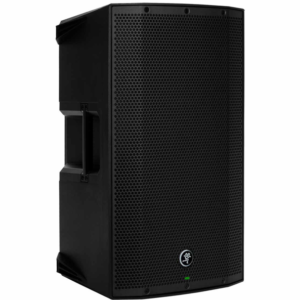 The Mackie Thump 18S features 1200W of power offering a robust low end sure to fill out your venue. With a sturdy but stylish construction, this subwoofer can handle the toughest of gigs while still looking great in any stage setup. If you need a small, discreet desktop speaker, then the 6.5” powered speakers are right for you. These speakers are perfect for quiet background music or desktop applications like computer monitor audio or other smaller mobile or fixed audio requirements. Compact and lightweight, the K82 by DB Technologies has 80W of power with a 6.5″ driver and separate tweeter. 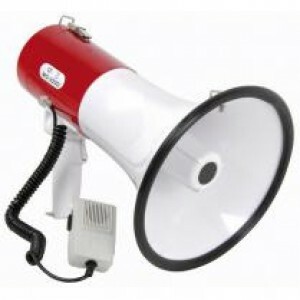 If you need to make an announcement or address a crowd while retaining maximum mobility, then maybe you need a megaphone or loud hailer. Our compact, lightweight, hand-held megaphones include a switch on and off siren function and a detachable hand mic for directional use. Offering more than six-hours talk time on one set of batteries, these megaphones are perfect for events, emergency training, school carnivals – any event that requires volume on the move. Rent for a day or a year.